It certainly is, yet it can be continuously renewed yearly, and one can change status while here. The other way is to apply for a work visa, and change status once here. Based on the hypo - I must be able to support myself here (US law) therefor I can't simply choose to just come here and have no means to support myself. The work visas seem the logical choice with the TN being the most logical as I have only competition from others from Mexico (5500 cap). Also, the TN only requires that I file a Labor Condition Application with the Department of Labor and a petition with the U.S. Citizenship and Immigration Service. More Anchor babies and another person working the underground economy leeching off the system that's what. That's been proven countless times. If one is here legally then there is no such anchor baby concept. And yet as a nation we allow for and grant more Visa's for immigration than all other countries. I would say that we really dont owe a VISA to any applicant. They are the ones seeking entry and they should have to prove why they are worthy of the gift. The point of which you and the OP are attempting to get at is the simple fact that there is no immigrant visa to come here for anybody in the world unless they are family or job related (for the most part - DV exception and E2 Investor). You can thank T Kennedy for that from the 1960's. I doubt it. There is simply no category under which such a person can apply. I thought diversity but IBMuseum says that is barred to Mexicans. So I see no path. Looking at diversity: the quote for Mexicans should be zero for a period of time since we already have so many here and I am talking about legal aliens only. I agree for the most part with your last sentence but I think that diversity should be taken into account also. So say you are a Mexican with a high school education. You visited the U.S. a couple of times to visit friends and you've fallen in love with America, the freedom, its culture, the great people, and you want to immigrate. But you've heard of all these illegals in the news giving Mexicans a bad name. 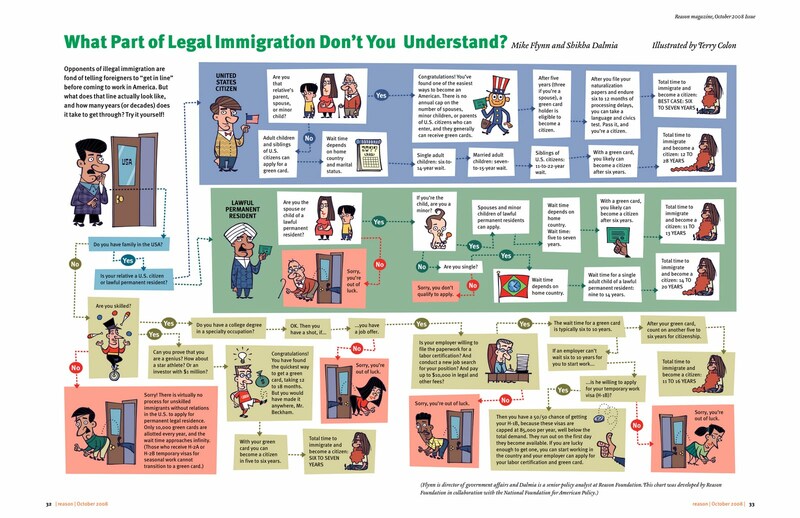 You've never broken a single law in your life and you want to go to the U.S. legally. You've never missed a day of work at the restaurant you work at, and would never consider living off the government's dime because it's against your conscience. You have no family in the U.S. but do have some friends who can vouch for you. Where should you go to wait in line? Is there a fee, a couple forms, and a test you can take to get his application going? What should you do? Moderators: Please don't move this to the Legal Immigration forum, I want to see what those who are active in the Illegal Immigration forum think about this hypothetical situation.